We love all the flavors in this soup and how they all meld together. The peppers offer a mellow and faintly sweet flavor, while the tomatoes and beef kick in that flavor that will remind you of a traditional stuffed pepper. 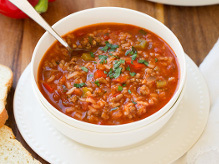 The rice in this soup gives it such a great texture and adds some body to it. This a fairly thick soup and it has a consistency similar to a stew, which we love because it will fill our families up. We just served it with fresh bread for a wonderful comfort food. 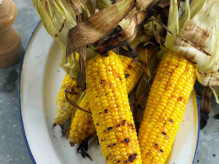 We remember sitting with family around the campfires in the fall having the lively discussion... Do you grill corn with the husks on or grill with the husks off? For us it is OFF! It gives a richer, flavor to the kernels. Then when you add our parmesan to the mix... well it is a flavor you will keep coming back for. Plus you have a handle! 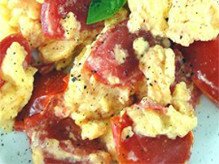 This is a simple healthy breakfast or even a quick dinner recipe everyone is sure to love.